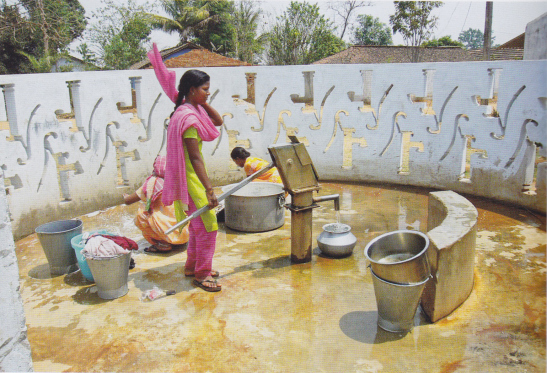 The project consists of a water pump surrounded by a muddy pool in the village of Kopaweda. The pump emerged as a central meting point for women in the village and nexus of daily activity, essential to daily survival. After a lengthy dialogue with the users of the pump, a group of artists decided to restructure the pump sites for free. 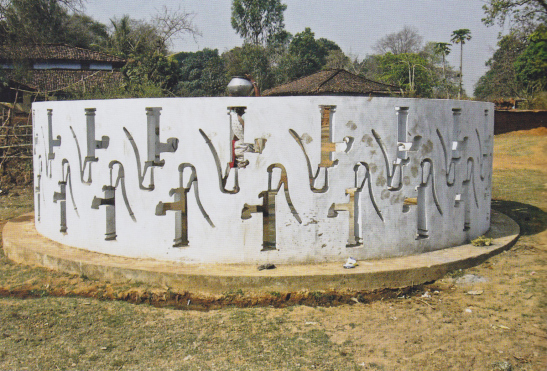 In 2001 the first water pump structure was built or Nalpar site, consisting of a smooth concrete pad, a more efficient pump design, an enclosure incorporating Adivasi cultural symbols, and a system of paved trenches to channel the water and collect it into smaller reservoirs. The sites operates on a more practical, ergonomic level and the construction was undertaken collaboratively. are prevented from entering the Nalpar. In 2007, they had constructed 3 Napalr sites in Kopaweda and 4 elsewhere in Kondagaon. Dialogue art Center (Navjot Altaf, Rajkumar, Shantibai, Gessuram), residents of Kopaweda and Kondangaon, women and children.